Today I would like to introduce you to one of my January sponsors Linda Dawkins of Mamma4Earth. Tell us a little about your lovely Etsy shop Mamma4Earth. My little Etsy shop began 4 years ago, a few years after we started homeschooling our children with the Waldorf philosophy. I have always enjoyed knitting and would often try to knit some of the more complicated projects that my mom was knitting when I was little, she would patiently show me how to form the stitches and eventually finish the item I was busy with. My creations are inspired by Africa and the beautiful and majestic animals that grace our continent. It is such an honour to venture out into the bush and observe them in their natural habitat. I love to watch the fluidity of their movement and their primal instincts come into play. This really helps me while designing and finishing a pattern. 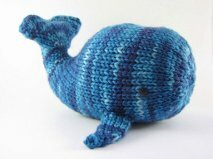 It’s one thing to knit a creature but entirely another to finish it off with the shaping that represents the traits of that particular animal. Do you have secret to share about how you find the time to create while homeschooling four children? Homeschooling has been the right choice for us as a family and because Jenna and Erin are getting older we decided to hire a tutor last year, to come in and assist us with the more difficult subjects physics, maths and science. Jenna is now in Grade 10 and needs to put together a 3 year portfolio and present it when she completes her schooling in her final year, matric. At first I wasn’t sure if I wanted a tutor, I always try and do everything myself and I was starting to feel a little burnt out. We decided to go ahead and look for a tutor and found the most wonderful woman, I am very grateful for her. Are you working on any new patterns? Care to share any of the details? At the moment I am thinking about a Lemur and a Panda, I like to spend a few weeks of thinking a design into being, looking at plenty of photos of the particular animal and observing them in their natural environment, if I am lucky enough to be able to visit a game farm that is not too far away. Once the thinking and observing period is over, I take out pencil and paper and draw the animal and then the designing of pattern rows begins. It is an exciting process for me and I really enjoy this part of my work. I often look at an animal and through its movement; I can see stitches and rows in my mind and imagine how this observation will translate into a design for a pattern. At the moment I am reading two lovely books on my Kindle, The Power of Now by Eckhard Tolle and At Knits End, Meditations for Women who Knit Too Much, by Stephanie Pearl Mcphee. What is your favourite spot in your home? My favourite time of day is right before dusk, just as the sun is setting. I really adore the beautiful colours of green, yellow and orange radiating across the sky. I can feel them in my heart. It’s both energizing and empowering. There are a few, spending quality time with my family, going for a cycle on my mountain bike and visiting my friends for tea (and knitting of course). You have one hour to yourself, how do you spend it? I will usually spend it knitting and then I start missing my family. What is the dream at the top of your bucket list? I would really love to travel to Alaska with my family. Thanks so much for taking the time to share a little bit about yourself with us. It was wonderful getting to know you a little better Linda. one lucky Mothering with Mindfulness follower. To enter today's giveaway, leave a comment, one per person, below. Be sure to come back and leave a comment for each extra entry. Giveaway is open until Saturday February 2, 2013 at 7pm. "My goodness, they are all adorable!" Mom, wife, teacher, and entrepreneur. You're an inspiration! I'm still trying to make sure I've brushed my teeth before everyone else awakes. Women like you show us that eventually, it's all possible. Thank you for sharing Linda. I've been wanting to try her patterns for ages! And added her to my etsy favorites. :)Thanks for the chance! I love her patterns! I follow here blog and love seeing the new animals she ones out with. Thanks for the opportunity to win a pattern! Oh, these patterns look so fun to make and fun for my littles to play with when they're finished! I am already a Mama4earth facebook fan! I love these patterns! They have that element of realism that's needed. I have drooled over these patterns before - but until now, I missed the FB page. Thank you - just "Liked" on Facebook. Been a fan on Facebook for a long time. Checked ETSY & discovered a Swan pattern plus a Llama one. Such fun to (try to) knit. I just love her patterns!!! I would love these patterns! Thank You. I have Mamma4earth as an etsy favorite. I just love Linda's patterns, and she seems like such a nice person as well! Thanks for the giveaway. I added Mamma4earth to my Etsy favorites! I also liked Mamma4earth on Facebook. Lovely giveaway. Thanks for the chance! These patterns look like fun and a challenge too. Added her to my Etsy favorites with your Berry Berry Handy link; thanks. Liked Mama on Facebook-very cute page she has set up with the little knitted critters all about the place so cheerful !~! I have followed our Linda Dawkins on Twitter for many months now. I am learning to knit slowly. So far I have made a roaster. I would like to make more. 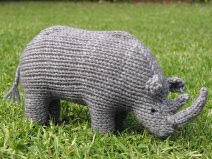 Love the rhino especially. What cute patterns from an inspirational woman! I have recently knit a few of her patterns and love them! I love, love LOVE Linda's patterns. Just finished knitting my daughter a rainbow unicorn yesterday. This is such a treat! She's in my Etsy favs. I LOVE Mamma4earth's designs. I have made many of her animals. Thank you for this lovely giveaway. Please enter me for the eight patterns. And thank you for making me check Etsy - I thought she'd been favorited for years - but no. So now things are put to rights. Cant decide if I love the piggy more than the horsie!!! Oh, I would love to enter! I just love the elephant and pig! So cute! What a great giveaway! A while ago I bought her rabbit pattern and I loved it! so easy to follow and the results were so CUTE! Thanks! What a wonderful giveaway! I bought her rabbit pattern a while ago and I loved it! So cute and easy to follow too! Thanks! What wonderful patterns she develops. The instructions and pictures are superior to any others I have purchased. I follow her blog and I look forward to reading her words every day. Truly a great person. I already "Like" her page on Facebook to make sure I don't miss a single word she has to impart on us. Linda's patterns are the best!!!! I so enjoy receiving and reading about you and your amazing family and all of your escapades and daily life you put to pen and paper! Keep up the wonderful journey you are destined to be on! Enjoy reading about Linda's life. She lives in a place so different than most. 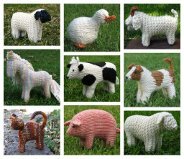 I love reading Linda's blog and would love to knit some of her lovely animals. Thanks for the opportunity! I was looking for patterns online as I wanted to knit something for my new baby and so many of the images I liked led me back to your patterns. It would be lovely to have a chance to win some! Will definately follow Linda on FB and Twitter! Linda's patterns show her talent for observation as well as her artistic talent. I would love to win all these patterns. Lovely patterns. I so enjoy her blog! Would love to win some of her patterns. I love Linda's patterns. I love how she shares her life with all of us. What an inspiration she is! That should read --"I favorited" her Etsy shop ...and I also like her already on facebook!! :O) I don't use Twitter ...but at least I have 2 entries ...worth a shot ---thank you for the opportunity! Hi. I liked Linda on etsy. I love her paterns. I love Linda's knitted animal patterns. I've made some of her cowls, but I haven't tried one of her animals yet. This would give me the reason to do so. Thank you for the chance. Mama4Earth is already one of my Etsy favorites. Thank you for the chance. Love her animal patterns. So cute! Now in Etsy favourites as well! Her patterns are lovely and make fantastic gifts! I love Lindas patterns- wish I could knit better but this may just be the inspiration I need! Love her patterns. Added etsy shop to my favorites on etsy. Thanks for the chance to win! Her patterns are always lovely! Thanks for sharing a little more details about her and for organizing thw giveaway. My goodnes, they are all adorable! Love the designs! Thank you for sharing your talents!! Added as a favorite to etsy! Would love some new patterns - thanks for the chance! I love her shop and patterns! Thanks for sharing!